The rhizome of the perennial herbaceous plant Potygonatum kinganum Coll. et Hemsl., P. sibiricum Red., or P. cyrtonema Hua. of family Liliaceae. Big, fat, white and transparent cross section. Unprocessed or stir-baked with liquor. Sweet, neutral; spleen, lung and kidney meridians entered. Nourish yin of lung, spleen and kidney, tonify qi of spleen and lung, and nourish kidney essence. It can nourish lung yin, and tonify lung qi. Though, it is weaker than Bei Sha Shen from the aspect of moistening dryness in lung and clearing lung heat, it can disperse phlegm and tonify lung qi, and it is very indicated for chronic cough due to yin deficiency with dryness in lung, sticky phlegm and difficulty in spitting, and both qi and yin deficiency. For dry cough without phlegm, or with little sticky phlegm, dryness in nose, dry and itching throat due to lung yin hurt hy dryness, both qi and yin deficiency, it is commonly combined with lung-moistening and cough-relieving herbs, such as Sang Ye, Xing Ren, and Bei Sha Shen. 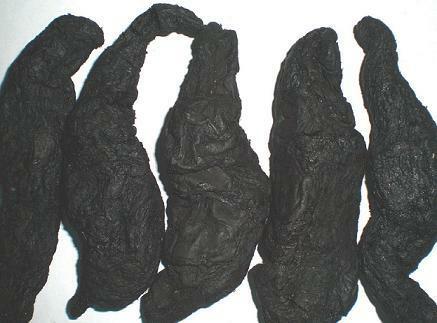 Ir can tonify kidney yin, so it is indicated for chronic cough due to lung and kidney yin deficiency, it is made into paste singly for long taking because of its mild action, or combined with lung and kidney-nourishing, phlegm-eliminating and cough-relieving herbs, such as Shu Di Huang and Bai Bu. It is a spleen and stomach even tonifying herb, because it can both tonify qi of spleen and stomach, and nourish yin of spleen and stomach. For fatigue, poor appetite, weak pulse due to deficiency of spleen and stomach qi, it is combined with qi and spleen tonics, such as Dang Shen, Fu Ling, and Bai Zhu. For dryness in mouth, poor appetite, tasteless eating, red tongue with little coating due to stomach yin and fluid deficiency, it is usually combined with qi-tonifying, yin-nourishing and fluid-producing herbs, such as Shan Yao, Yu Zhu, Mai Dong and Shi Hu. It can nourish kidney, supplement essence, and nourish kidney through tonifying spleen. For soreness and limpness of lumbar and feet, dizziness, tinnitus, early white of beard and hair due to kidney essence insufficiency, it is applied singly or combined with yin-nourishing, kidney-tonifying herbs, for instance, it is used with Gou Qi Zi in Er Jing Wan from Qi Xiao Liang Fang (Magic Effective Prescriptions). For diabetes due to yin deficiency, it is used singly in large dosage with effect or combined with herbs that can nourish yin, clear heat, produce fluid and relieve thirst, such as Sheng Di Huang, Mai Dong, Shi Hu and Tian Hua Fen. It should be used with cautions for dampness accumulation due to spleen deficiency, damp-phlegm stagnation and distending abdomen due to qi stagnation because of sticky and greasy properties.